Today I’ve decided to wear my tour guide hat, and fashion a special excursion for our retro-loving trendsters. 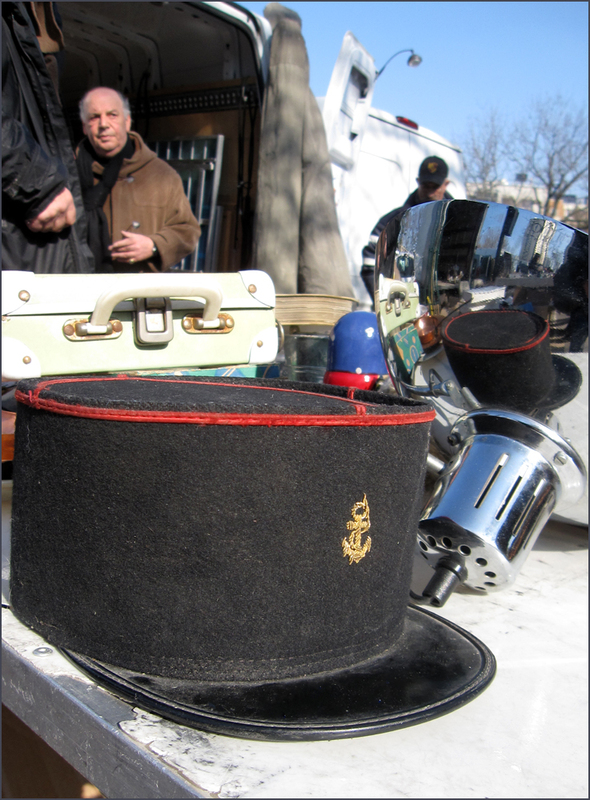 Boasting about recent vintage scores never gets old, so let’s sail to the Porte de Vanves flea market. Once you’ve arrived, take a deep breath. Keep your head. 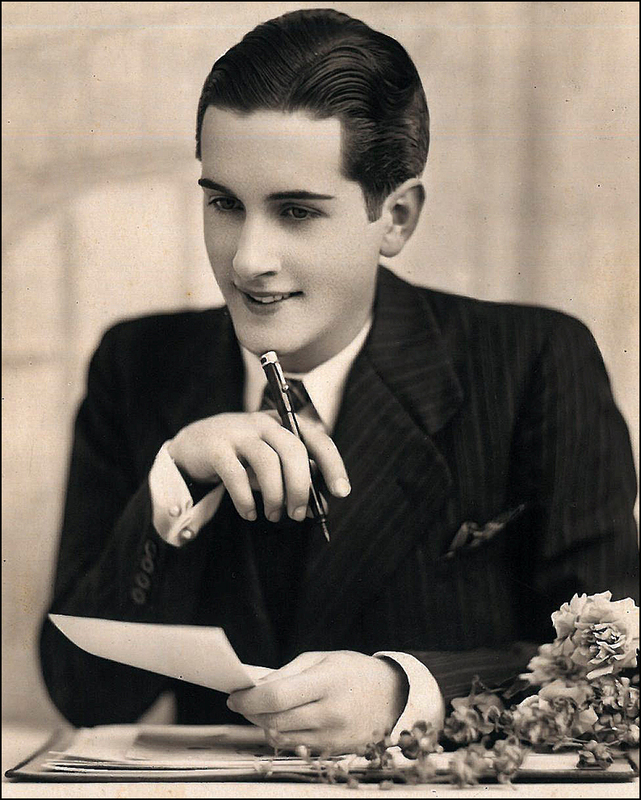 Throughout the flea market, you’ll find scads and gads of vintage clothes, along with perfume bottles, belts, bags, hats, hat boxes, jewelry, sunglasses, and shoes. Also, watch out for haute couture labels. 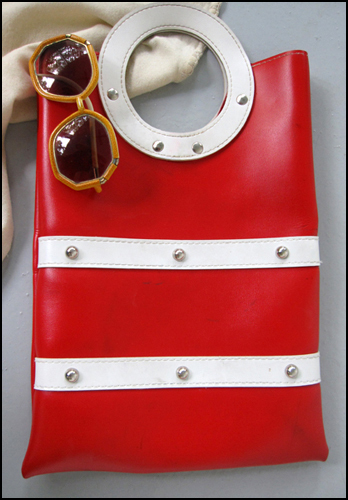 My latest Porte de Vanves booty includes a nautical cap and an ultra-mod studded bag in red, along with a thick pile of vintage fashion magazines. And none cost more than five euros. I also found two pair of Ted Lapidus hexagonal sunglasses for even less. Back in the day, Ted Lapidus (Brigitte Bardot’s favorite designer) introduced a groovy kind of unisex dressing, coolly meshing nautical, military, and safari-inspired outfits with jazzin’ blue jeans. I’ve always been a big fan of the wardrobe mix-n-match. For the love of money and juxtaposition, who isn’t? So when I got back home, I paid tribute to the late, great French designer by dressing up my newly acquired accessories with a striped shirt, a pair of skinny denim jodhpurs, and red tall riding boots. Très, très Chic Ahoy! Days and hours: Every Saturday and Sunday 8 a.m. to 1 p.m. These are great finds, Theadora. 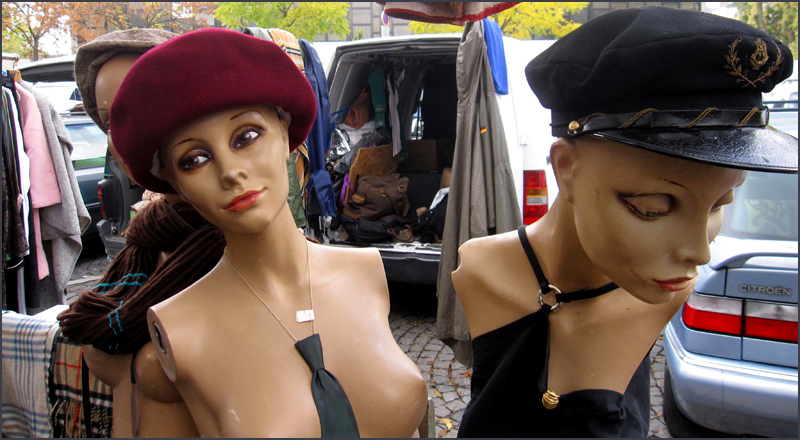 I’d love to spend time scouring these flea markets out there in Paris but then when we are there, there simply is no time as there are just so many attractions to see. You’re lucky to be living in such a beautiful city.